CESAR® Bakies crunchy based treats were designed for small dogs. Each treat features a fun loving shape (heart, bone or paw) with a crunchy texture. Each flavour differentiated through colour. 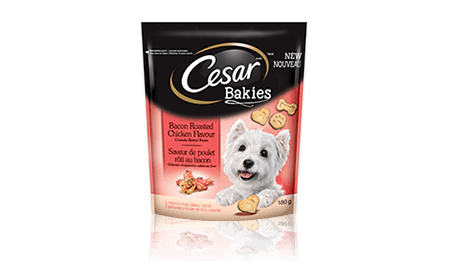 CESAR® BAKIES™ treats for small dogs are delightfully delicious crunchy baked treats. With a tantalizing taste, these whimsical, bite-sized treats are sure to satisfy. WHEAT FLOUR, CORN GRITS, SUGAR, ANIMAL FAT (PRESERVED WITH BHA), NATURAL FLAVOUR, POULTRY LIVER FLAVOUR, SALT, BACON ROASTED CHICKEN FLAVOUR, SODIUM METABISULFITE, CARAMEL COLOUR, BHA, BHT, IRON OXIDE.